When I first saw Good Foxy live in 2014 I knew that they were going places – the atmosphere was electric. In my view they are without a doubt one of the best young bands today. 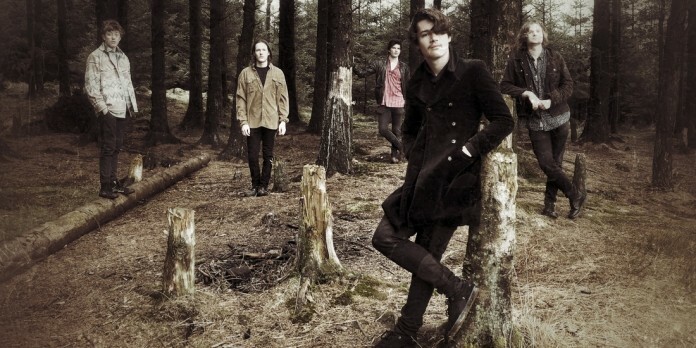 Forming in Clitheroe back in 2013, the members George Banks (guitar and lead vocals), Henry Crabtree (guitar and vocals), Freddie Bruhin-Price (bass and poetry), Callum Sykora (drums and percussion) and James Robinson (keyboards, harmonica and vocals) shared an innate love of music. Influenced by Hendrix and The Doors, the band emits sounds akin to blues-influenced 1970s psychedelia. Over the past few years Good Foxy has proven themselves to be one of the most active bands in the North West of England. This has resulted in the release of the High Watt EP (September, 2014) which featured five studio tracks and a live version of ‘Tastes Like Sugar’. This particular recording was taken from their popular performance at a Blackburn-based unsigned bands competition. My favourite tracks on High Watt are the songs ‘Winter is Coming’ and ‘Shattered’ – none of which made it onto their debut album. ‘Winter is Coming’ is hugely laid back and you will hear heavily reverbed guitars that effectively amp up their psychedelic tone. ‘Shattered’ is a magical acoustic instrumental that has a soothing, calming sound. Their aforementioned album was released on the 25th of September, 2015. When the release date came around I quickly snapped up a copy and whacked it into my stereo… and it was an odd start to say the least: a bizarre crescendo of sound featured in the opening track ‘Haze In’, followed by the re-recorded ‘Seek’. But I nearly fell off my chair with the third song, ‘The Days Never Change’ – it was brilliant, beginning with a clean rhythm section with a smooth drumming tempo, the pace then picking up as Banks’ vocals coolly layered over the introductory foundations. In ‘Down the Rabbit Hole’ it gets a little eccentric, probably being the most sonically intriguing track as it could easily be mistaken for a song from the seventies; Bruhin-Price’s bass rips through the middle of this one and it is hugely exciting. I believe strongly that Good Foxy are outstanding live, having seen them several times myself. It quickly became apparent to me that the band really works at honing their craft, clearly improving each time that I see them, with Banks being one of the most charismatic frontmen I have seen in a long time. Each individual within the band has their moment to shine but, ultimately, they are at their mind-blowing best when they are rocking out as the unified singularity of Good Foxy.